From the Control Panel, open the Imaging tab. Before you can create a new velocity picking, you have to first create an Episode. At the tab header, click the Add icon and select New Episode to configure a new episode. The Create Episode window will be displayed. At Name, type an episode name. Episodes function as folders in the Imaging tree and contain the velocity picks. The prefix is used as a DUG's internal naming rule, in which users are required to name their directories (hence their episodes) sequentially. This way, you will be clear in exactly what order things were done as a typical imaging workflow involves multiple iterations of picking/tomography/migration. Tip: To rename the episode, double click on the episode in the Imaging tree. The Edit Episode window will be displayed. Type a new name for the episode and click OK. You will NOT be able to change the episode type after creating the episode. Now you can create a new velocity picking. Select the Episode and click on New Velocity Picks in the Details Panel. The Configure Velocity Picking window will be displayed. Alternatively, click the Add icon at the tab header and select New Velocity Picking. At the Select Episode window, choose the episode that you have just created and click Select. The Configure Velocity Picking window will be displayed. Type a Name for the Velocity Picking. Select the Shared check box if you want to make the velocity picks visible to other users. At Pre-NMO Gathers, select an offset gather volume to be used for picking. You must choose a gather that is NOT an NMO-corrected gather volume. Select the Pick effective η (eta) check box to also conduct anisotropic RMO imaging (eta picking). 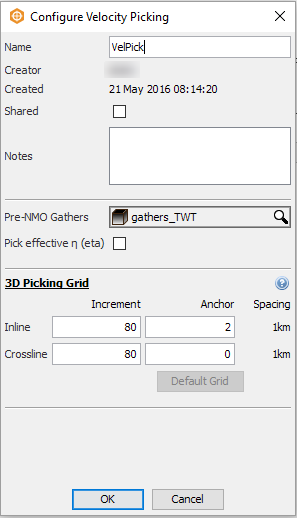 At the 3D Picking Grid section, type a value for the Inline and Crossline increments (you can only use increments of 4) to specify the grid on which to conduct your velocity picking. You can see the resulting Spacing on the right. At Anchor, type the values to anchor the grid. Click on Default Grid to set the spacing based on the default grid. The default spacing is set at 1km x 1km. Click OK to confirm the velocity picking configurations. A new velocity picking item will be available as part of the episode in the Imaging tree, and the Velocity Picking window will be displayed. See Using the Velocity Picking Window to begin velocity picking. The output from the velocity picking can be found in the Volume tab, including the picked velocity, automatic stack and semblance. You can change the display of the output parameters like any other volume.